Nicknamed the Tar Heel State, North Carolina is situated in the Southeastern United States, and is bordered by South Carolina and Georgia to the south; Tennessee to the west; Virginia to the north; and the blue waters of the Atlantic Ocean to the east. The state of North Carolina boasts a varied geography, highlighted by miles of pleasant shoreline, the rolling Appalachian Mountains, and protected forestland, including the Blue Ridge Parkway and Great Smoky Mountains National Park, the two most-visited national forests in the United States with more than 25 million visitors last year alone. These different terrains make North Carolina an ideal locale for the sport of mountain biking, and the state plays hosts to a number of dedicated trails that are recognized among the country’s best. 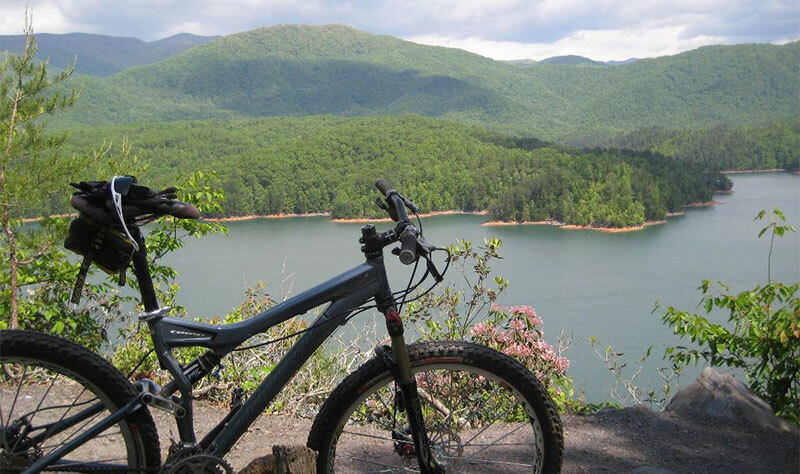 To help you become more familiar with the mountain biking scene in beautiful North Carolina, below we have compiled some helpful information regarding five of the state’s most popular and oft-ridden trails. Situated in the quaint and beautiful town of Bryson City, North Carolina, the Tsali Recreation Area offers 30 miles of multi-purpose tracks, with courses fit for a wide variety of riders. Tsali plays host to four single track loops that collectively hug the shores of Fontana Lake, a sparkling oasis that adds a measure of coolness to this rugged ride. All of the trails at the Tsali Recreation Area are exceptionally fast, built on hard-packed dirt with mostly moderate climbs and amazing scenery. Along the various routes riders will be challenged by a number of obstacles and impediments, including rocky jumps, steep drops, side hill berms and a number of natural outcroppings designed to keep them on their toes. The trailhead at the Tsali Recreation Area features a bike wash station for the convenience of riders and there is also a well-maintained campground area complete with showers and flush toilets. Backcountry camping is also allowed anywhere on National Forest lands, for free, except in designated wildlife fields. Tsali was recently honored with the IMBA “Epic” tag and deserves all the accolades it has earned. Kerr Scott is home to three main trail systems: Dark Mountain, Overmountain Victory Trail, and Warrior Creek, as well as several shorter trails that either loop or connect to the three main courses. The system of trails here lies between the Brushy Mountains and the Blue Ridge in the Yadkin Valley, an extremely historic corridor that once served as a path for the renowned Daniel Boone, as well as the Overmountain Men and plenty of illegal moonshiners. Of the three main courses at Kerr Scott, Dark Mountain is by far the most technical. The final section of this trail includes a thrilling descent with banked turns and alternate-line jumps that are sure to test riders’ nerve. Once they make their way out of the wooded area, riders will make their way along a gravel path to the top of the local dam, upon which they will be rewarded with some of the most breathtaking scenery North Carolina has to offer. Campgrounds are available at Kerr Scott and are located right next to the trail crossings, so route planning at this locale can include “ride-in/ride-out” options. Located just outside the very metropolitan city of Charlotte, North Carolina, the Back Yard Trails (BYT) system is an “advanced” rated, 11-mile course with a modest elevation gain of approximately 1,000 feet. There are essentially two areas that host these trails: the first is roughly 3-4 miles in length, while the second, and slightly easier section, spans some 6-7 miles. The two Back Yard Trails are well-marked, and riders are urged to keep right as they enter the recreation area. Known locally as one of the most unique trail systems in the entire state of North Carolina, BYT has a little bit of everything that riders tend to hold dear, including an abundance of jumps, ledges, rock drops, crazy skinny’s, cannons, a concrete half pipe, a few tough climbs, and the infamous “Poo Tracks,” a section of the course that promises to test riders’ balance and their ability to hold their breath as they careen to the bottom of the course. Back Yard Trails are managed by the Mecklenburg County Parks and Recreation division and are generally open year round save for periods of track maintenance. Located in the city of Ashville, North Carolina, Bent Creek is billed as the region’s “go-to trail system, and with a deeply-ingrained mountain bike culture, both in the Asheville/Brevard area and in Western North Carolina in general, Bent Creek sees a ton of mountain biking traffic, particularly on the weekends and holidays. The trail system at Bent Creek is composed of two very different areas: a flatter trail, and a much more mountainous section that follows the ridgeline. There are several single track and double track trails in the lower, much flatter areas near Lake Powhatan. These are great trails for beginner riders, or for intermediate riders looking to warm up or cool down. These flatter segments of the trail system include Deerfield Loop, Explorer Loop, Homestead, Lower Side Hill Trail, and Pine Tree Loop. Those looking for a heart-pounding climb and insane descent should make their way to the ridgeline. It is here they will find the renowned section of the trail known as Green Lick, a super-fast and flowing descent filled with massive berms and wall rides to rail, a few rock gardens, and several technical rock features. Bent Creek boasts a number of different trailheads and manners to access the trail, and on most weekends, all of the trailheads are all filled to capacity. Cars that can’t squeeze into the recreation area’s parking lots are known to line the nearby forest roads, and Lake Powhatan Campground is usually filled up as well. This might be the busiest mountain bike trail in all of North Carolina… and as riders will surely see after experiencing this trail system, there’s good reason for it! The system of trails at Wild Turkey is located in the well-known city of Greensboro, North Carolina. The courses, which have recently become some of the most popular trails in the state, have now been cleared of most of their roots, resulting in a well-groomed course of single track that is fast, entertaining and free-flowing, with berms, rock jumps, skinny’s and a few challenging climbs. Wild Turkey, as described by the city of Greensboro, is the perfect backdrop for an adventurous bike ride, regardless of your level of expertise. At just under five miles, the trail features a tight ride, moguls, log pyramids, bridges of varying sizes, woop-dee-doos, small climbs and a massive rock jump. The trail connects with two other watershed trails—Owl’s Root and Reedy Fork—ensuring continuous rides no matter where riders opt to explore. The trailhead for Wild Turkey can be accessed from the Lake Brandt Marina, where there is plenty of parking available.